Minister of Social Cohesion, Dr. George Norton and President David Granger at the opening of the UNDP-Guyana government Social Cohesion Validation Workshop. Inflammatory tirades in the public domain, run the risk of degenerating the social stability of the populace leading to civil violence, a situation compounded by existing ethnic polarization—an unfortunate colonial legacy that pervades the political climate. This was the dire warning by Head of State, President David Granger, who Thursday met with stakeholders gathered to validate a national social cohesion plan, at the Georgetown Marriott Hotel—a confab organized by the Ministry of Social Cohesion and the United Nations Development Programme (UNDP). Delivering the keynote address ahead of the workshop’s working session, President Granger used the occasion to caution perpetrators and Guyanese generally, to desisting from contributing to the social erosion that has generated violence in the past. Acknowledging post independence efforts at mending tattered race relations borne out of Guyana’s colonial history, President Granger told a packed to capacity conference room, ethnic polarization, remains an unfortunate legacy in the local political sphere—a situation that has in turn spawned social marginalization. 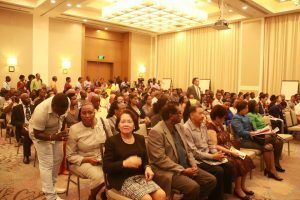 A section of the attendees at the opening of the UNDP- Guyana government Social Cohesion Validation Workshop. Front row includes First Lady Sandra Granger, Public Security Minister Khemraj Ramjattan, Minister of Indigenous People’s Affairs, Sydney Allicock and Minister of Social Protection Amna Ally. Steering clear of the alleged ‘race hate’ attacks over the Phagwah weekend at Canal #1 West Bank Demerara, President Granger instead used his address to appeal to religious, ethnic, political and other social diversities permeating Guyana to be seen as an asset and not a liability. Granger said the nation has already been scarred by the violence of the 1960s and more recently in 2002. The President in calling diversity an asset versus a liability, pointed to the co-existence of religious worship houses (Mosque, Temple, Churches) in a single community without the taint of religious violence or racial riots. He said social cohesion is also viewed in a Guyana context as an indispensable element to public security hence the work on the part of the Ministry in leading the formulation of the Draft Strategic Plan for Promoting and Enhancing Social Cohesion in Guyana (2017-2021). 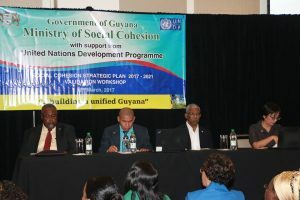 The One Day workshop was organized by the Ministry of Social Cohesion bringing together stakeholders from across the spectrum to ‘validate for implementation’ the SPPESCG (2017-2021) and was held under the the,“…building a unified Guyana.